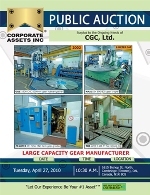 Corporate Assets Inc. | CGC, Ltd. - Corporate Assets Inc. FEATURING: (2002) G&E CNC 500 mm hobbing/gashing and internal gashing machine; MAAG SH 600/800; MAAG SH 500 SH 300/500; MAAG 30SH 300/400 gear shapers; TOS F016 hobber, (3) NILES ZST2 CNC grinders, G&E 72 high column vertical hobber, KLING 1600 gear checker; FELLOWS, TOS, LORENZ, PHAUTER etc. gear shavers, shapers hobber, sharpeners. Also:TOS 13 horizontal boring machine; TOS SKJ 12 60” VTL, LEES BRADNER 12” threader, CNC mills, lathes, grinders, key seaters.